I bet that you have fancied at least once the idea of displaying an Android app on your monitor. It's true that a phone's screen and even a tablet's screen may give a limiting sensation, but that's the compromise you need to make for the mobility it offers you. Yet there are quite a few Android apps that have no counterpart on the PC. So it was a natural step for people to begin wishing for an emulator of sorts. Truth being told, there is a number of applications that run Android apps, but none are truly user friendly. None but BlueStacks of course. Let's make one thing clear. 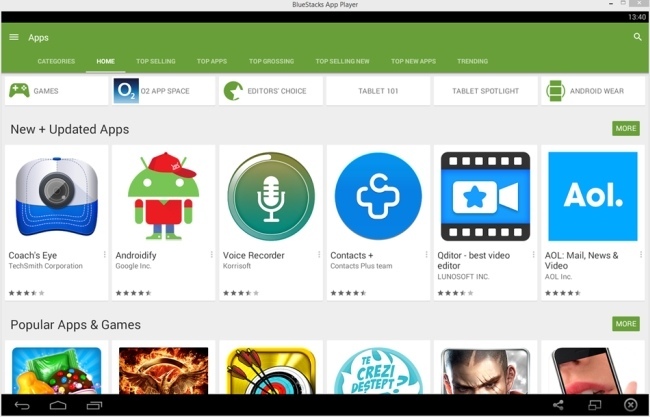 Although everybody calls it BlueStacks, the name is simply App Player. At least that's how I'm going to refer to it anyway. 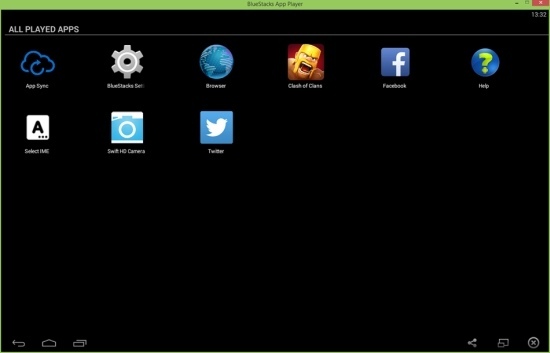 The App Player concept is very simple. You start it up, you connect to Google Play, install what you need and run it. The interface is pretty simple. The main screen is a list of recommendations in different categories (mostly games). Clicking on one will open the Play Store. From then on you can install it just as if you would on a tablet or phone. Apps run at your current resolution, constrained only by the window size. I have a slight problem with this . The window size is fixed and the only other option is extending it to full screen. The other thing that really annoys me is the orientation. There is no real way to force the screen orientation. Granted, the default is landscape and most apps not only work but are designed to look good on landscape. Still, messenger apps and others that involve lists or reading pages might not be displayed as intended. I suppose these are enough dislikes. What do I like about it? It works! This little beast can run anything from the Play store and run it well. There is no need to search for .apk files or anything else that vaguely involves tweaking. There is a Settings screen though so you do have a bit of customization but not much anyway. App Player is a pure pickup and play program. You should note that as long as you're using the standard version, you will be prompted to install apps that you don't necessarily want. They can be uninstalled of course. Still, if this bothers you, you can subscribe to the Premium variant which gives you faster speeds and removes the mandatory installations for $2 a month. For all of it's shortcomings, App Player is really the one thing you want to run Android apps on the computer.